Emotions are the key to understanding financial markets. However, it's tough to make rational decisions based on them. Even if you think you read your emotions or other peoples emotions, you may get lost in trying to comprehend the feelings of the crowd. And the market sentiment is the emotions of millions of traders around the world. If you'd like to know more about it, read the guide by SimpleFX WebTrader. The behavior of the masses works differently from the mechanism that determines individual actions. The discovery is quite old and well described in a book by a French anthropologist Gustave Le Bon in 1895 "The Crowd: A Study of the Popular Mind." The author states some of the characteristics of the psychology of the crowds: "impulsiveness, irritability, incapacity to reason, the absence of judgment of the critical spirit, the exaggeration of sentiments, and others..."
Every trader knows the importance of emotions. You can see it in market volatility; you can see that some stock is overvalued in comparison to the company's fundamentals, and others are undervalued. Just like people on a rock concert, football game, or political demonstration transcend from individuals to a crowd, traders around the world create an entity that has its emotions and moods. The state of mind of the crowd of traders is called market sentiment. For Forex and especially cryptocurrency traders fundamental analysis is much more difficult to apply than on the stock market. That is why these markets traders focus on technical analysis. Bulls, bears and "dumb money." 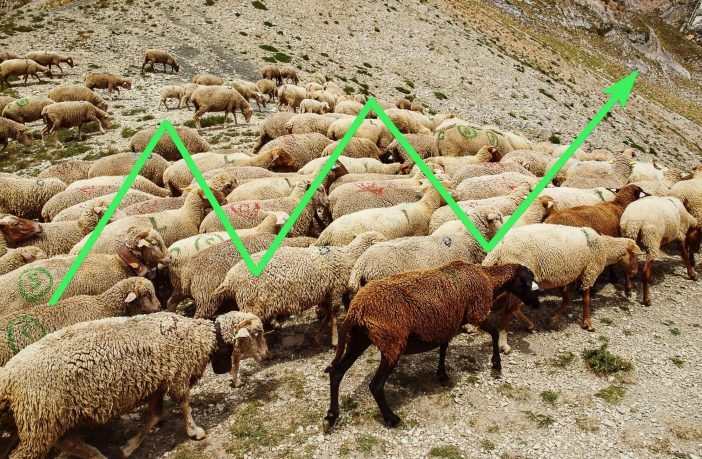 Understanding the sentiment will let you know whether the crowd is optimistic (bull market), cautious or pessimistic (bear market) about a currency, stock or crypto. Identifying the current trend can help you predict the future overall market sentiment and will open sentiment-based trading opportunities. Market sentiment works for all kind of markets, but it is very difficult to read. There are big players, such as institutional banks that can play against the prevailing sentiment, and seek for so-called "dumb money." Wait until the crowd gets all in on a particular position - be it long or short - and use the trading power to incite a reversal. There are two possible strategies for using the market sentiment. You can go with the current and try to join the crowd or trade against the sentiment. 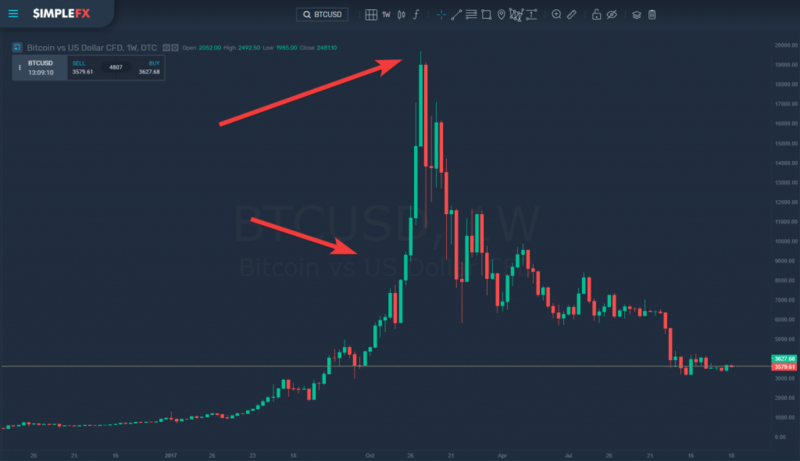 The first strategy would include tactics involving the Fibonacci retracement tool, that can help traders profit from local price corrections. The second strategy is all about hunting for reversals identifying support and resistance levels and taking into consideration the overall market sentiment to decide whether a breakout may happen. Safe-havens play an important role when the market sentiment goes to extremes, or there's an overwhelming uncertainty. Assets like gold, USD, CHF or JPY are considered an excellent shelter in case of too much risk. When more volatile assets are entering a bear market, traders (including the most prominent players) tend to seek these safe-havens, which automatically creates a bull market on ultrasafe assets. Fear and greed are the most dominant emotions among traders. They are either afraid of losing money, or they want to earn more. Greed is overwhelming at market peaks when the bubble is created. More and more people open the same long position on a hot asset be it a tech company, a currency of a fast-growing economy or a popular cryptocurrency. Just take a look at the most significant burst in crypto. On the other hand, fear takes over when the market hits bottom. Traders are panicking underestimating the real value of an asset. A savvy investor can see an opportunity for opening a long position in these situations. However, trading against the trend always involves high risk. How to identify fear or greed? When you see a trend accelerating breaking new resistance levels without any fundamental explanation - no critical information that would justify it - you may expect the greed is in action. The same mechanism works the other way around with fear. If during a downtrends support levels are broken without an apparent reason, the fear may have taken over. How to spot "dumb money." "Dumb money" is where traders are taking the most popular and the most obvious moves. Everyone takes the hottest position, more and more people join and put themselves in a very vulnerable position. Let's take a look at Forex, a market where individual traders compete with the largest banks to make successful trades. Forex is as susceptible to market sentiment. Both the biggest institutional traders and the smartest individual traders see where the "dumb money" goes. Then when there's the right time, the most prominent players open an opposite position and take the profit. You can find indicators that show the number of traders having a short or a long position on an instrument. It turns out that the market almost always suddenly goes the other way rapidly cleaning the trading accounts of those who "hang out with the popular kids," that follows the crowd. The market sentiment is very easy to read if you take a look back. Everything seems to be visible. Even if you are new to trading, you can easily spot greed taking over just when the bubble is about to burst. However, at the time of the bubble, hardly anyone notices it, even the wisest and most experienced traders. It's difficult to profit directly from fear or greed taking over. Even if you can read the past and present sentiment correctly, you need to know what the collective traders’ mood will be like tomorrow. Without any insider knowledge or ability to influence the prices with your trading volume it’s impossible to do it repetitively. What is the best market sentiment strategy? Keep away from it. If you don't use the most popular technical analysis tools and don't trade reversals, you can avoid the riskiest moves. If you don't want to play the "dumb money" but avoid it, you can focus on developing an effective trading strategy. You don't have to know where the "dumb money" will go. All you need to know is where the "dumb money" is usually and at present. There's no good way to chase sentiment. It doesn't matter if you want to trade along with it or against it. Guessing the future sentiment is a risky move, that’s why avoiding market sentiment at all may prove to work best for you. Doing so you could develop a sustainable trading strategy with the right mixture of technical and fundamental analysis. Don't chase the sentiment. Invest not in the most popular assets, such as EURUSD, but the ones that are off the more radar. It’s best to find your own niche. 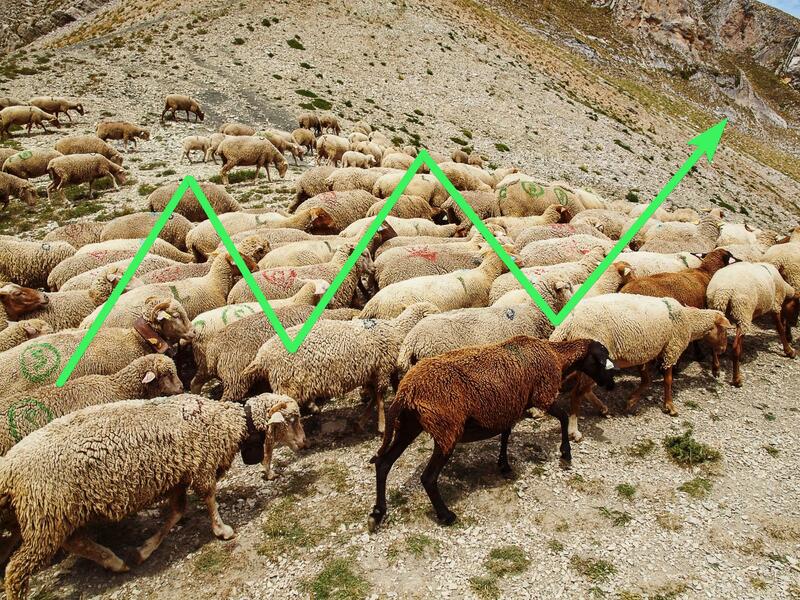 Don’t be a herd trader. 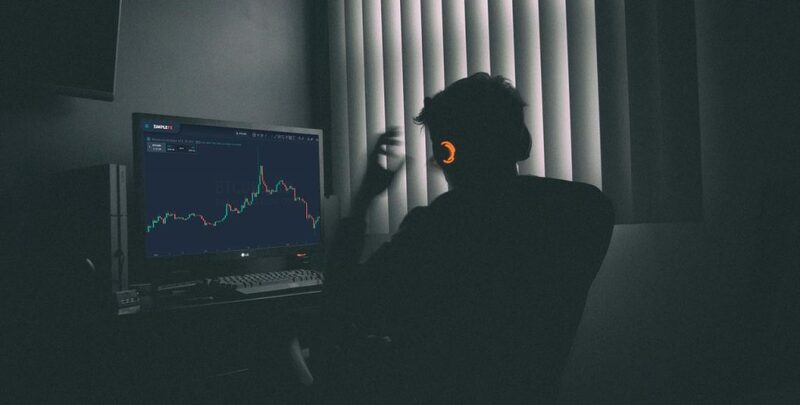 Choose one of the hundreds of instruments available at SimpleFX WebTrader, and use the best technical analysis UX and tools to learn how to trade effectively and don’t get disturbed. Previous ArticleIs Increasing the Supply of Bitcoin a Good Idea?